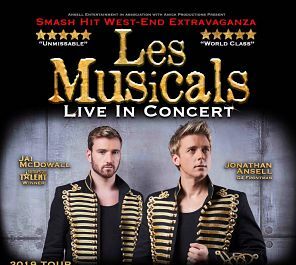 ​Jonathan Ansell (G4 frontman) and X Factor winner Jai McDowall have joined forces to create a very special, dramatic concert. This vocally dynamic evening showcases hit songs from the greatest musicals of all time, brought to you by two of the best voices in the business. (Sadly Rhydian Roberts who was part of the duo for the 2018 tour is no longer able to do the 2019 tour with Jai now taking his place). It includes classics from shows including Les Miserables, Phantom Of The Opera, Blood Brothers, Wicked, Jesus Christ Superstar, Carousel, West Side Story, The Lion King, Miss Saigon, Chess, Rocky Horror Show and We Will Rock You. Below are the tour dates we have so far.